It's officially spring and at this time we need to start taking care of our immunity more carefully, because in winter we used all vitamins that we had and now entering spring we need to restore it with new ones. 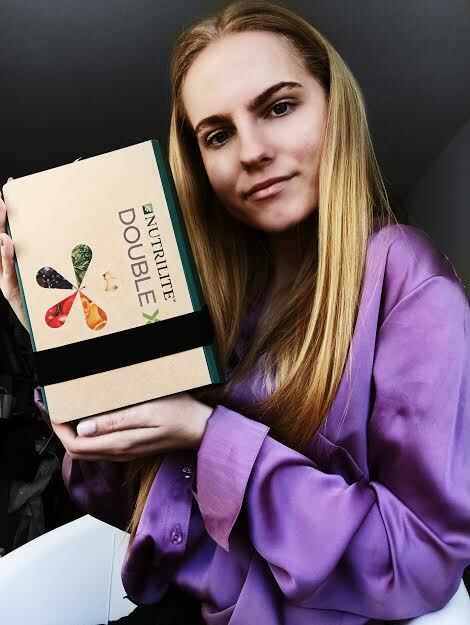 So, I had a chance to try these NUTRILITE DOUBLE X vitamins from Amway. I was super excited when I opened this package and found it. For the longest time I needed new vitamins, because I constantly feel tired and my immune system is always low. And now I had a possibility to try these! Nutrilite™ Double X™ supplement is power-packed with vitamins, minerals and phytonutrients to help support a healthy heart, brain, eyes, skin, bones and immune system. So, it is perfect for everything! It contains 3 kinds of vitamins that are packed separately. In just two servings a day, get 12 essential vitamins, 10 essential minerals and 22 plant concentrates, including every color on the phytonutrient spectrum. The key ingredients are: Turmeric, Rosemary and Fava d'anta. All of them are natural ingredients - it is filled with many vitamins and other minerals. All these 3 kinds of vitamins are packed in one plastic box with compartments that helps not mix it. Really convenient and simple to use. I have been using them for the past few weeks and my body feels good! If you are interested in checking this product - check out this link. I know this post is a little bit short, but for a long time now I was so inactive on all social media. I had no will for doing anything and I feel bad for being inactive, but I hope i will get back to it soon. Hope you understand me and see you soon!